"Nothing can be gained" by broadcasting a new ISIS video that shows the grotesque burning death of a Jordanian hostage, CNN executive Tony Maddox says. That point of view has been echoed by executives at many other major news organizations. Almost unanimously, the news outlets are refusing to show any portions of the video. But Fox News is standing out by showing an image of the hostage being burned alive on television and by posting the entire 22-minute video on its web site. Fox's decision was assailed by some terrorism analysts and journalists -- "even by their standards, running barbaric ISIS snuff movie is really appalling," Stuart Millar, the Guardian newspaper's head of news, wrote on Twitter. The newspaper quoted counter-terrorism and radical extremism expert Malcolm W. Nance as saying that Fox is "literally -- literally -- working for al-Qaida and ISIS's media arm" by spreading the video more widely. 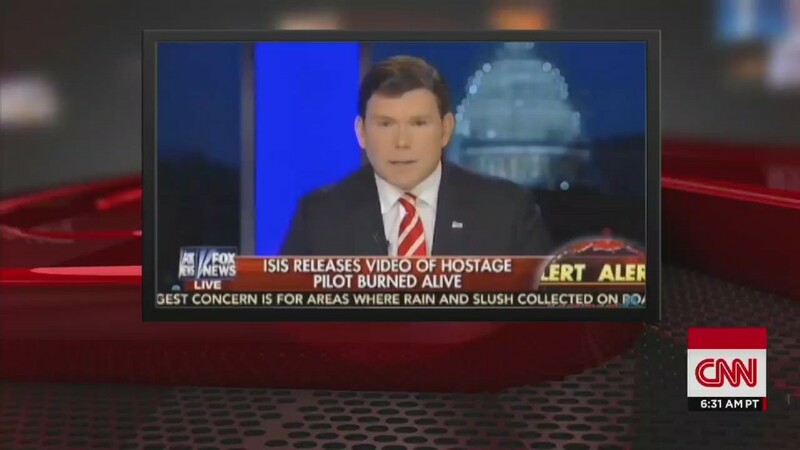 Bret Baier, one of the main anchors at the highly-rated cable news channel, explained the decision to show an image from the tape on Tuesday night. During Baier's program, "Special Report," he warned the audience about the disturbing nature of the image before explaining the news outlet's reasoning. "The reason we're showing you this is to bring you the reality of Islamic terrorism and to label it as such," Baier said. "We feel you need to see it so we will put up one of these images on your screen right now." At that point, a single image of the hostage, military pilot Lt. Moath al-Kasasbeh, being engulfed in flames was shown. The image remained on the screen for roughly 40 seconds as Baier described the the video. Then Baier told viewers that it was safe to watch again. Prominent Republicans -- some of whom are regulars on Fox -- argue that the Obama administration has not been sufficiently responsive to what Baier called "the reality of Islamic terrorism." John Moody, an executive vice president at Fox News, said Wednesday that the video was published in full to give people "the option" to see it. "After careful consideration, we decided that giving readers of FoxNews.com the option to see for themselves the barbarity of ISIS outweighed legitimate concerns about the graphic nature of the video," Moody said in a statement to CNNMoney. "Online users can choose to view or not view this disturbing content." A number of conservative news web sites and media figures followed Fox's lead. The former Fox News host Glenn Beck, who now runs an Internet and cable channel called The Blaze, published images from the video on his web site on Wednesday. "It is time to wake up," Beck said. "It is time to recognize what you are up against, look it square in the eye and call it by its name, evil." Baier's pronouncement about the "need" to see the image had echoes of one of Fox's best-known conservative voices, Sean Hannity. In 2004, Hannity's radio show played audio of the dying gasps of Nick Berg, an American who was beheaded by terrorists in Iraq. "Even though you don't want to hear it, I think you ought to make yourself hear it," Hannity said at the time. Another news outlet owned by Rupert Murdoch, the New York Post, also showed an image of the hostage being killed. Other news organizations have not published still photos or the video, reflecting a long-standing view that audiences should not be shown gruesome closeup images of death, except in very specific circumstances. Maddox, the executive vice president of CNN International, said in a television interview on Tuesday that CNN's policy about ISIS videos will continue to evolve. "The next case, we will judge on its merits," Maddox said. In the past, CNN has broadcast still photos from ISIS videos, showing the faces of hostages before the moment of execution. But with "this most recent one, which is truly horrific, there is no editorial justification for showing it at all," he said. "A key criteria is: ISIS wants us to show it," Maddox added. "If ISIS wants you to show something, you should start with the principle of 'How can we avoid doing that?' Sometimes you can't, because it's editorially a key part of the story. But in this case, you can." He said showing the images "impinge on his dignity" and spread ISIS propaganda, and "why should we indulge that?"